Former Lotus Notes users may prefer to see unread messages in red rather than just bold. 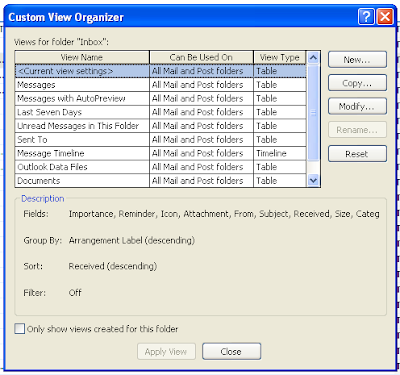 Microsoft Outlook uses two different views to display message lists to the user: Messages and Messages with AutoPreview. We will need to change the font color to red in both views to ensure that all Outlook folders display the message lists as intended. Select the Messages view and click the Modify button. This will bring up another pop-box box with several buttons on the left-hand side. Find the button called Automatic Formatting and click it. Another pop-up box will appear. First make sure Unread Messages is highlight in the selection box at the top. In the bottom section labeled "Properties of selected rule," click the Font button. This produces a fairly standard Windows font selection pop-up box as seen below. The font color is changed using the Color drop down box indicated by the arrow in the image below. Once the color has been changed to red, click OK. In the Automatic Formatting pop-up box, click OK to accept the changes. In the Customize View: Messages pop-up box, click OK to accept the changes. Once you are done, repeat these steps for the Messages with AutoPreview view. 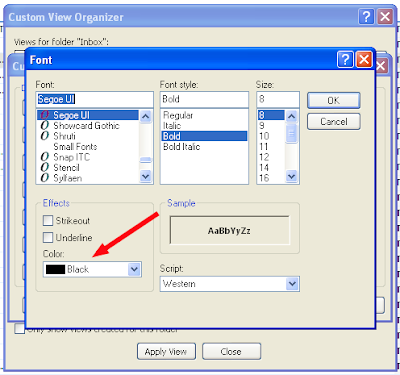 When complete, click the Close button on the Custom View Organizer pop-up box.